Koreans Living Within Visual Proximity of Dokdo Since at Least 512 A.D. The following page gives the reader a sense of Korea’s ancient presence in the Dokdo region. Dokdo Island is sometimes referred to as Liancourt Rocks or Takeshima by Japan. Here we will see some of the evidence of Korean activity on Dokdo’s most proximal land mass, Korea’s Ulleungdo. First we will get an overview of the Dokdo region by examining some maps. The map below left shows the entire East Sea (Sea of Japan). Ulleungdo is located West of Dokdo Island and was historically known from being visible from there. Many historical records also describe Korea being visible from the Ulleungdo – Dokdo region. The map below right shows Ulleungdo Island. Marked in blue are some of the locations where archeological artifacts have been discovered and excavated. Above left is a map of the Dokdo region. To the right is a map of Korea’s Ulleungdo the blue dots indicate places where evidence of ancient Koreans have been found. At only 87 kms away, Ulleungdo Island is Dokdo – Takeshima’s most proximate land. On clear days Dokdo Island is visible from Ulleungdo and this is recorded in many historical records throughout the ages. 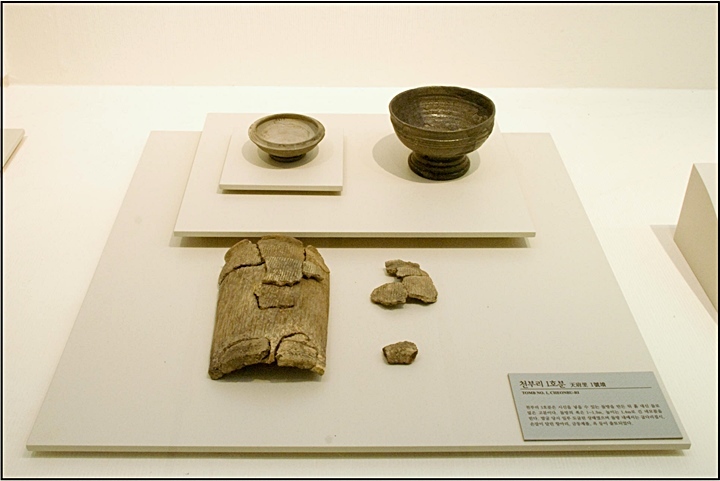 (see link) The ancient records and artifacts presented below are evidence of Korean involvement in the Dokdo region at least 1000 years before the first Japanese. Only a narrow-minded few would deny Korean cognizance of Dokdo knowing ancient Koreans resided within visual proximity of the islets for a full millenium. 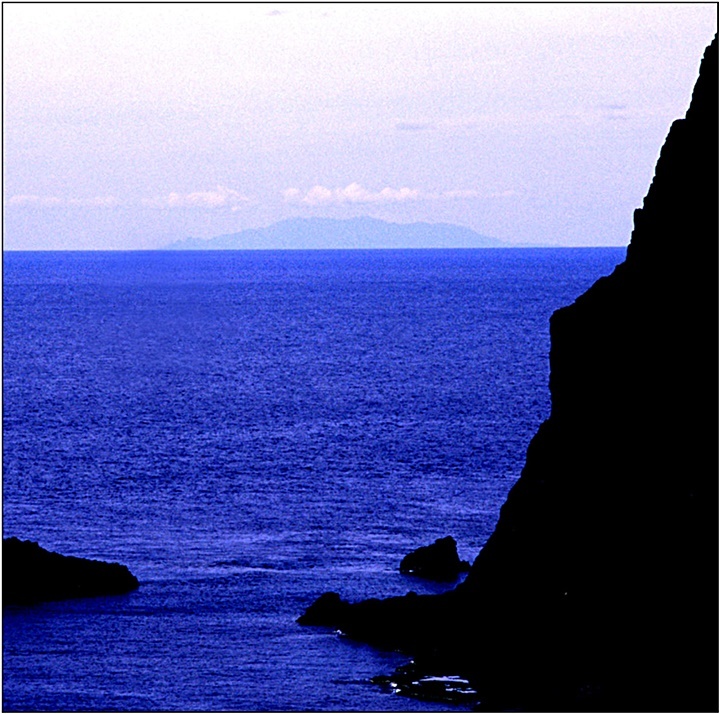 Above left: This image is a picture of Ulleungdo Island taken from Dokdo Island. 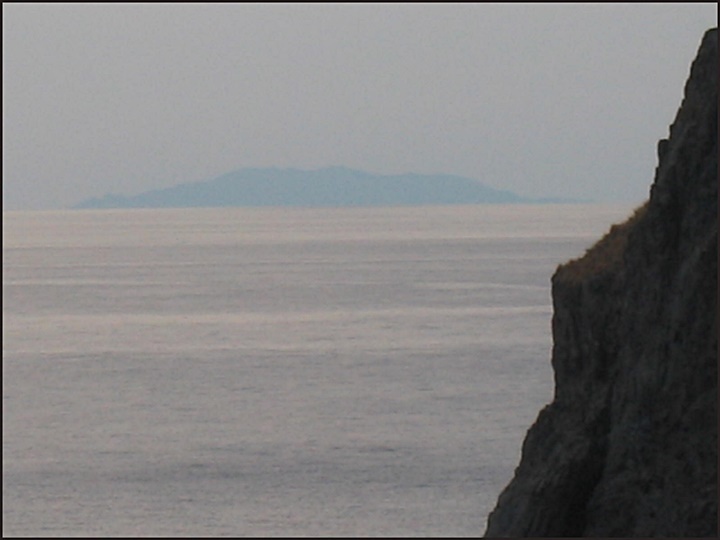 Above right is a recent photograph of Dokdo Island taken from Ulleungdo Island. Regarding historical documents, there are no records of Dokdo – Takeshima (Japanese or Korean) separate of Ulleungdo. It’s a valid conclusion that historically Japan considered Ulleungdo and Dokdo sister islands. The Korean side considered Dokdo as an island that bordered on the limits of Japanese territory but separate from Japan. It could be said Korea considered Dokdo as a milestone from which far beyond was a foreign often hostile neighbour and thus Dokdo was Korea’s limit. Records show us, to Korea and Japan, Ulleungdo was the “Hawaii of the East Sea” (Sea of Japan). Located near the center of the East Sea was know for rich forests and marine resources. Ulleungdo Island was the big prize and ownership of her determined possession of Dokdo. Without Ulleungdo there was little reason for Japan to covet Dokdo, just two barren rocks, void of fresh water, trees, and around five days return voyage in very heavy seas. The archeological search for traces of ancient people on Ulleungdo started during the era of Japan’s colonial rule over Korea. The most prominent members of the archeological team were Torii Ryujo and Professor Fujita Ryosaku of Japan. Notably, Torii Ryujo took a photographer with him when he went to Ulleungdo between late October and November of 1917 searching for relics in Hyeon Po, Cheonbu, Namyang, Namseori etc,. 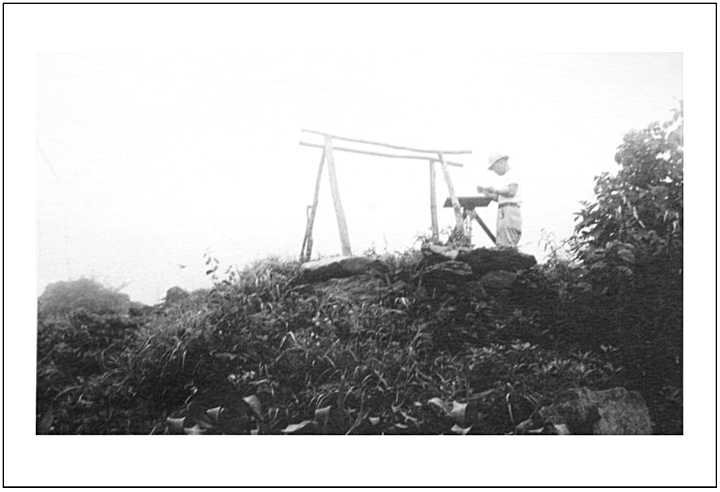 To the right, a Korean archeologist surveys tomb # 38 at Ulleungdo’s Hyeon Po Ri in the year 1957. (click image)The excavation of relics on Ulleungdo was first undertaken by the Korea’s National Museum in 1957 and 1963, which was after Korea’s liberation from Japan. By then, a lot of the tombs had been either looted or destroyed. The survey team tried to get the exact locations of the tombs on the island as well as excavate them. Because the tombs were highly visible stone structures above the ground, the tombs on Ulleungdo were recorded throughout history. Even many ancient Chosun maps show the locations of these burial sites by marking the locations as “石葬”. Apart from the test excavation by Yeong Nam Univeristy Museum in 2000 when there was a study about the rows of upright stones in Hyeon Po Ri, surveys so far were mostly for specific locations of the tombs and relics on the island. On July 8th, 1957 the National Univeristy survey team (Kim Won Yong, Yun Mu Byeong, Im Cheon) boarded a passenger train bound for Dae Gu to study Ulleungdo. They travelled via Dae Gu, Pohang and then to Ulleungdo. It took three full days before the could get serious on their work of surveying as late as July 12th. The three left images above shown (on the left) are a Korean tomb at Nam Seo Ri on Ulleungdo Island. 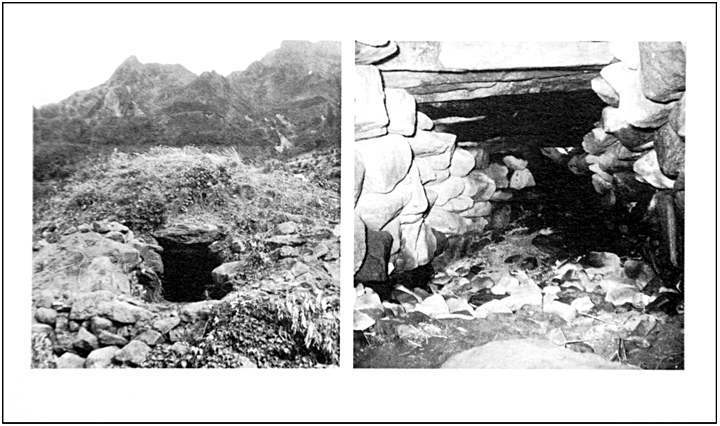 The two pictures compare an ancient tomb on Ulleungdo (left) with a tomb from Kyeongju (right) click pictures. The team painstakingly recorded the locations of the tombs in Hyeonpo, Cheonbu, Namyang and Namseo Ri and carried out excavations of some sites that were found preserved in fair condition. In June and September of 1963, Mr. Kim Jeong Gi of Korea’s National Museum visited Ulleungdo for a second survey on previously unfinished work from the past and to take photographs. This time he unearthed a surprising discovery and also surveyed tomb #1 in Cheonbo Ri. Remarkably this tomb had been preserved free of looting. Above left: A typical Korean burial mound. This tomb was located in Nam Seon Ri on Ulleungdo. Above right: The images above are of a #16 burial tomb located at Hyeon Po Ri. These pictures were taken in 1957 as well. Click for large images. These discoveries are of great significance because they revealed the location and construction of the tombs. These burial cites also yielded remains and relics which made known the time era of their construction. All of the tombs found on Ulleungdo are made of stacked stones and most of them are built above ground. 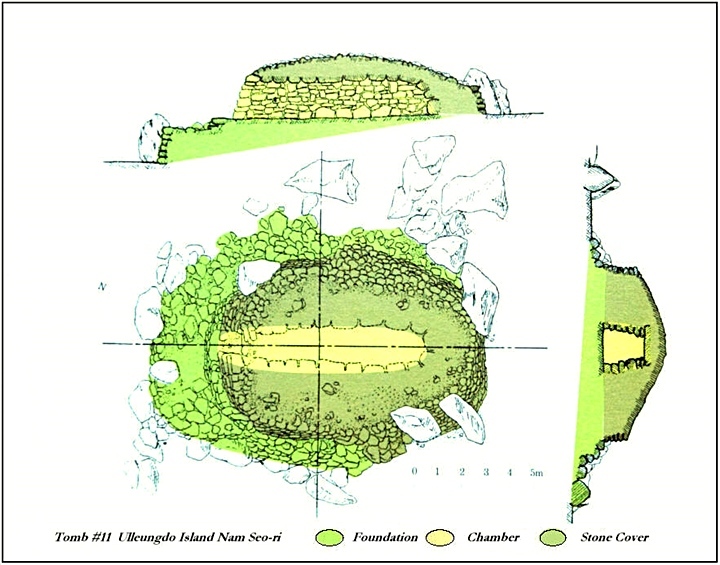 First a level stone-earth platform was created and then a chamber was formed to house the body. Next, they covered the chamber with stones instead of soil. 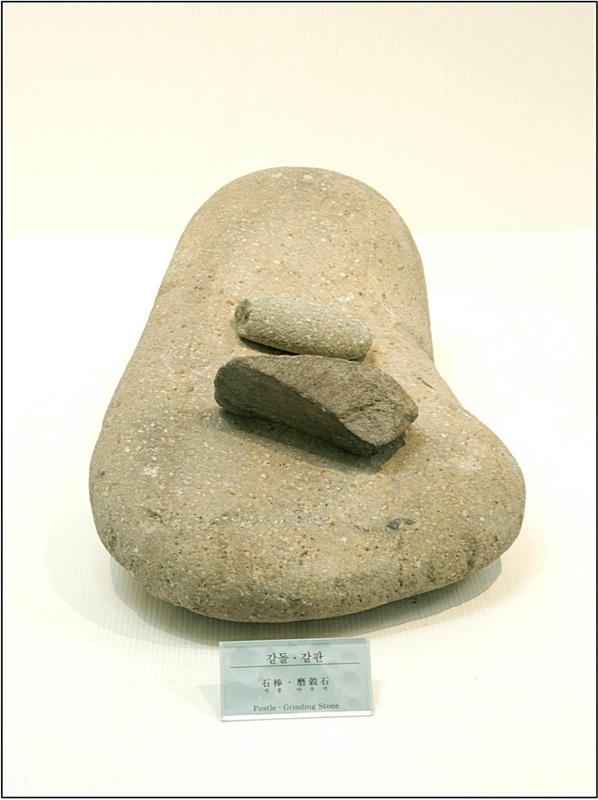 Stones were utilized due to the lack of soil on Ulleungdo Island. 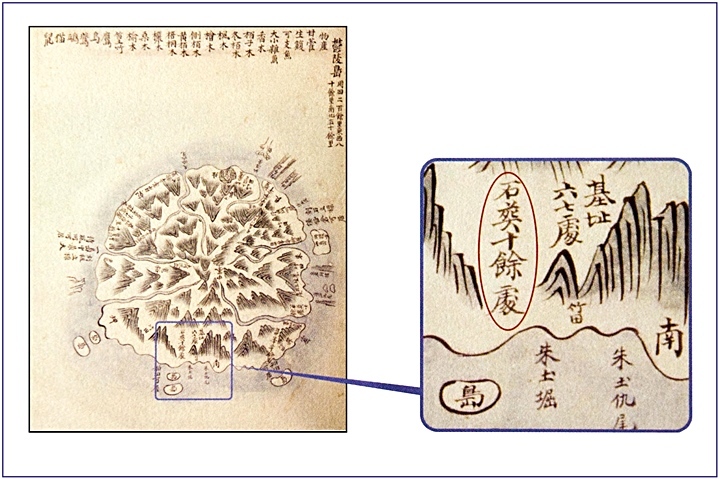 Above left: This map, like most ancient Korean maps of Ulleungdo, showed the location of old burial tombs and marked them as “石葬”. 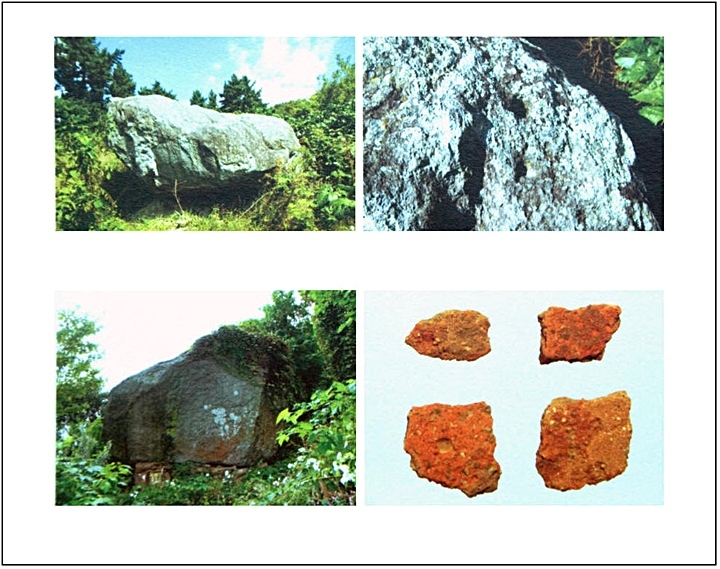 Above right: Pictures of ancient Korean dolmen tombs from Ulleungdo’s Nae Su Jeon near Jeodong and from Namseo Ri. The tombs had only one entrance with stone walls on either side and they made a roof of carefully positioned flat stone slabs to complete the structure. Some of these tombs are up to ten meters long but most of them 4 to 7 meters long and from 1 to 1.6 meters high. The chamber containing the body has a long rectangular form but it looks similar to a fish because the middle portion is slightly rounded. These tombs are located on hills near coastal areas or mountainsides and the entranceway almost always faced the ocean. Also with regard to Ulleungdo’s tombs, they are different from those found in Shilla’s Gyeong-Ju. Gyeong-Ju’s Shilla tombs, were made of stones with a path leading to them, while Ulleungdo’s tombs had only an entrance with no path and used stone grave mounds instead of soil. 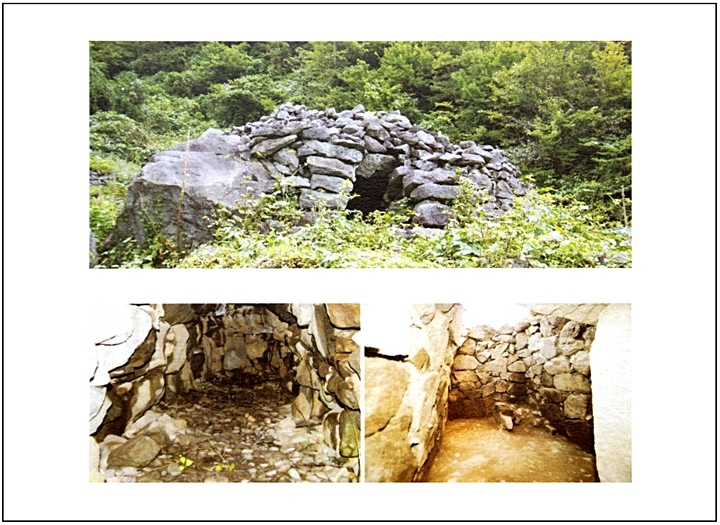 The tombs described above are evidence of Korean activity near Dokdo during Korea’s Unified Shilla Era (668-935 A.D.) However, archeological evidence of ancient Koreans on Ulleungdo predate the 6th Century. This is proven by the dolmen (called go-in-dol, in Korean) found on Ulluengdo Island. A dolmen (also known as cromlech, anta, Hunengrab, Hunebed, quoit, and portal dolmen) is a type of single-chamber megalithic tomb usually consisting of three or more upright stones supporting a large flat horizontal capstone (table). Through the excavations earthenware, jade glass, glided bronze and iron artifacts etc., were uncovered. Pottery was the most common among the objects found during these archeological digs. Mounted bowls, stamped pattern vases and rectangular vessels are greyish-blue. 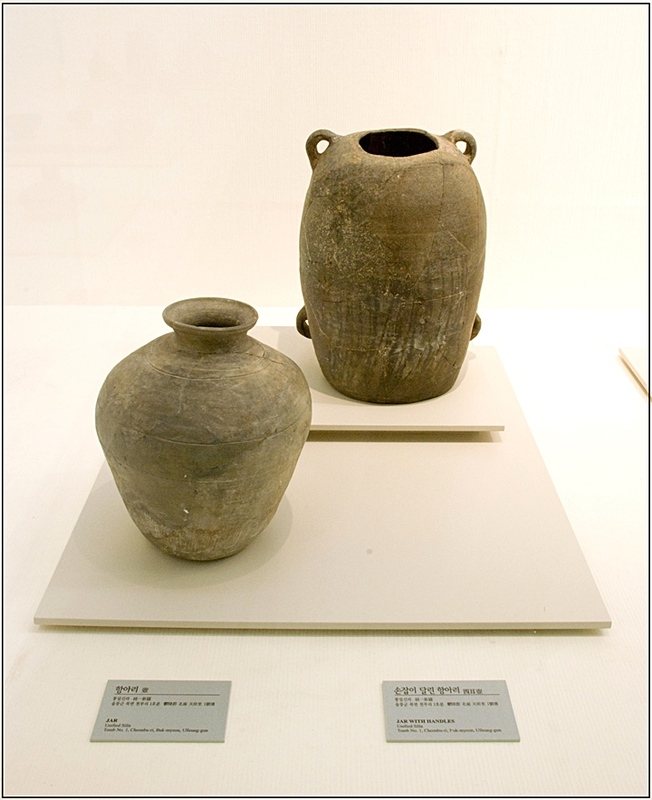 They were an ancient Korean pottery called Gyeong-jil to-gi. 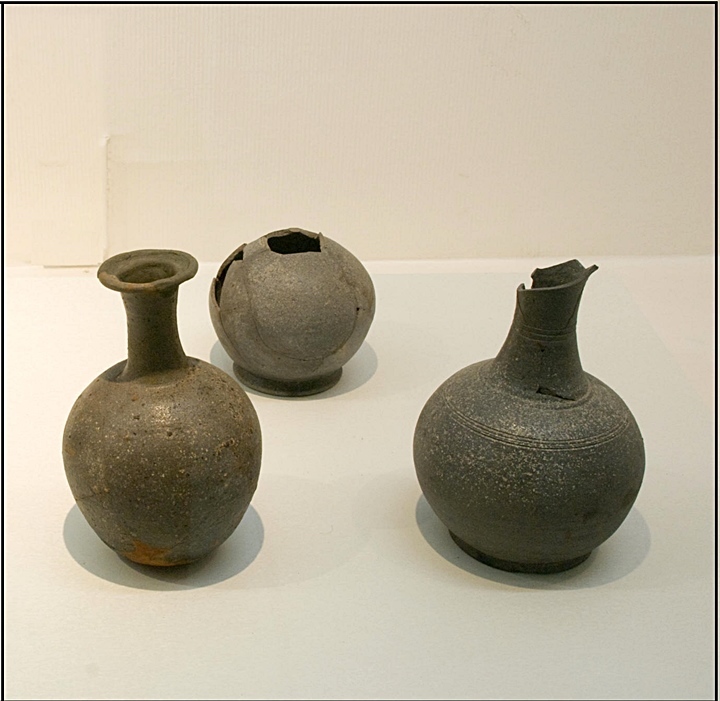 These were made on the Korean mainland between the 7-10th Century which proves the tombs were from Unified Shilla Era. 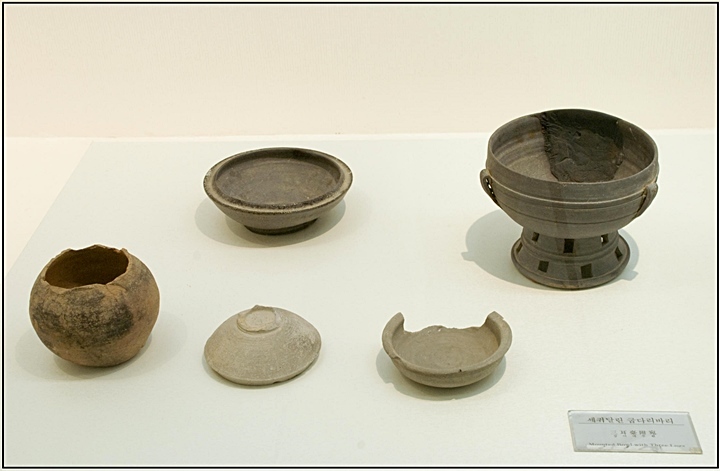 More Ulleungdo pottery from the Unified Shilla Era (668-935 A.D.) The short mounted bowl to the right could possibly predate the Unified Shilla Era. Click all pictures twice for larger image. 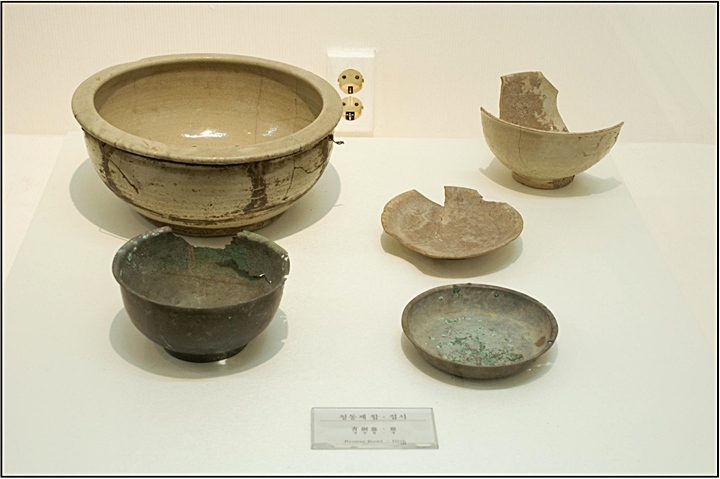 These artifacts also prove Koreans were sailing to Ulleungdo from the Korean mainland at will around 1,000 years before the Japanese appeared in the region. However, there is a great possibility the short mounted bowl and mounted bowl with handles could set back the date as early as the mid-6th Century. 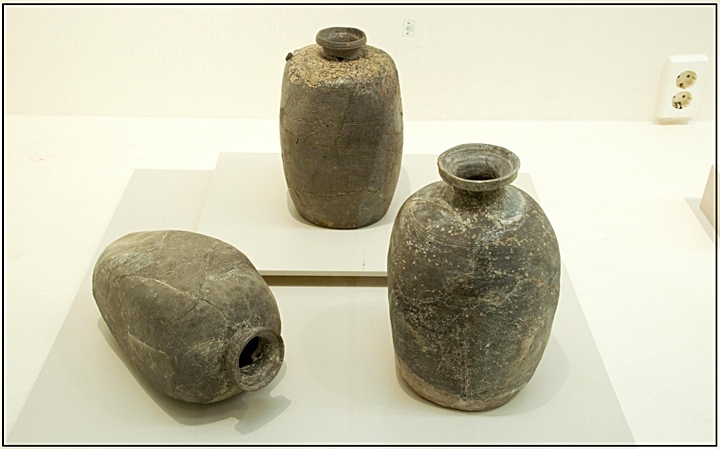 Top left: Unified Shilla Era (668-935 A.D.) water vessels also found at Cheonbu-Ri. Above right, the orange-brown color and different technique used in this earthenware suggests it was made in a diffent region of Korea or perhaps on Ulleungdo Island itself. 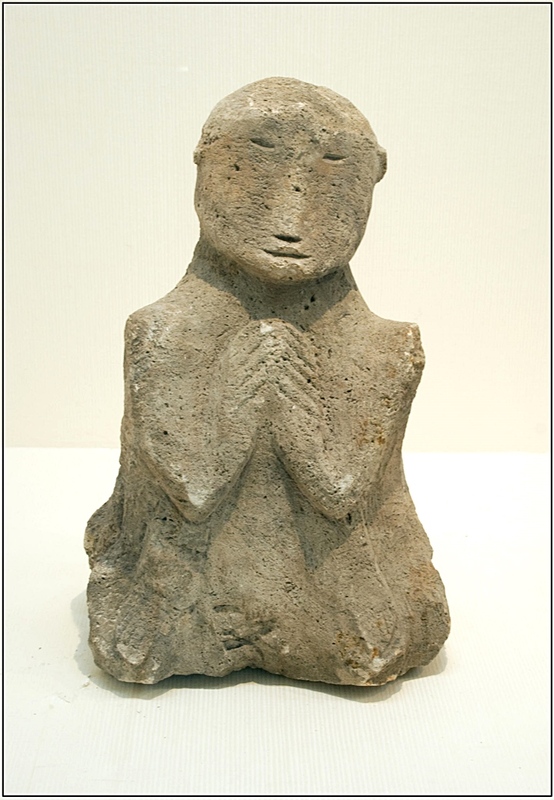 This is called Yeon-jil to-gi pottery. The process involved using a piece of wood placed inside the pot to enlarge it or make it firm, resulting in a grooved pattern being formed on the surface. Both the greyish-blue and reddish-brown earthenware were excavated from the same soil level inferring they were from the same time era (United Shilla). …”In the late 7th Century when Shilla unified the Three Kingdoms, the Shilla Government reformed the local administrative structure for more effective territorial governing and dispatched aristocrats. In this process, (Shilla’s culture centered in Gyeong-Ju) spread throughout all local areas of the Korean peninsula. 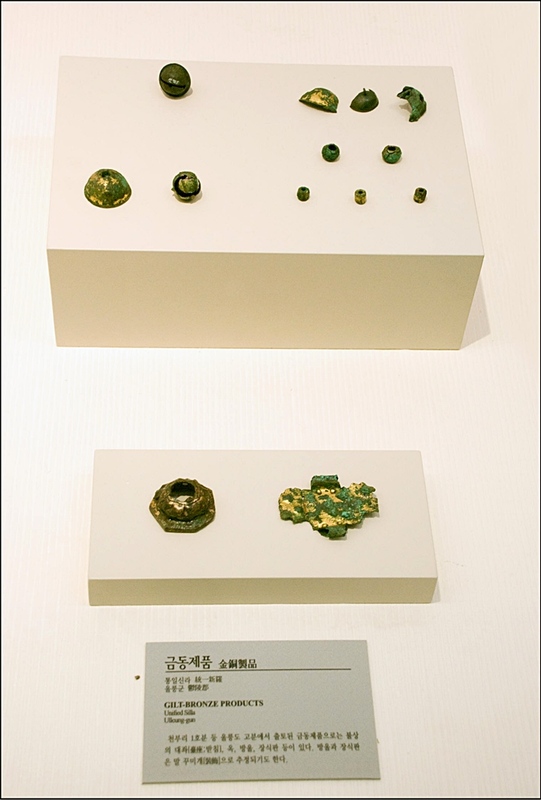 Above left: Remnants of a Unified Shilla Era (668-935 A.D.) crown, earrings and bells. 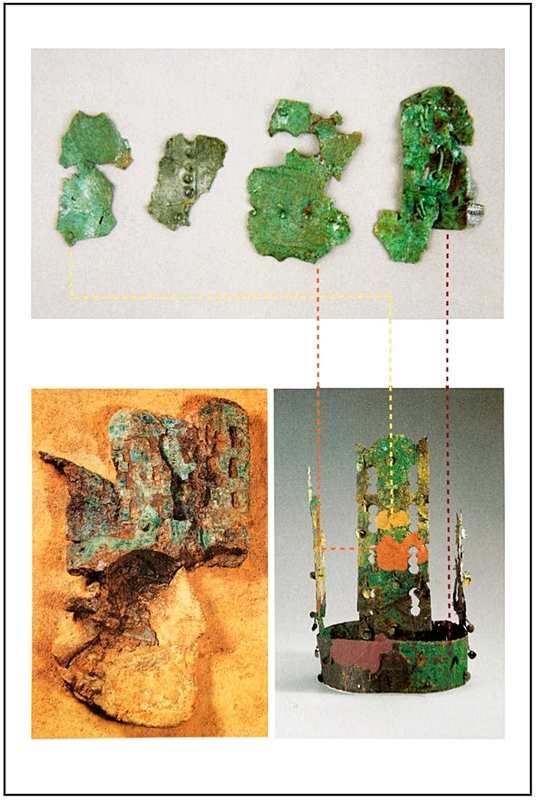 Above right: This diagram shows how the gilded bronze fragments form the Shilla Dynasty crown found on Korea’s Ulleungdo Island. Another artifact showing Ulleungdo’s connection to the Korean mainland is a bronze crown that was excavated from ancient tombs found on Ulluengdo Island. (seen on right) Only a few fragments are left but they are very similar to deteriorated Shilla crowns. Ulleungdo’s Shilla crown is comparable to those found in Danyang North Chungcheong Province and Chu-Am Dong in Dong Hae City both on the Korean mainland. Considering Ulleungdo’s geography as an island, the bronze crown imported from the mainland, is a clear sign of Korean sovereignty over the Ulleungdo region during the Unified Shilla Dynasty. Above left: This beautiful but crude carving portrays a person in prayer. 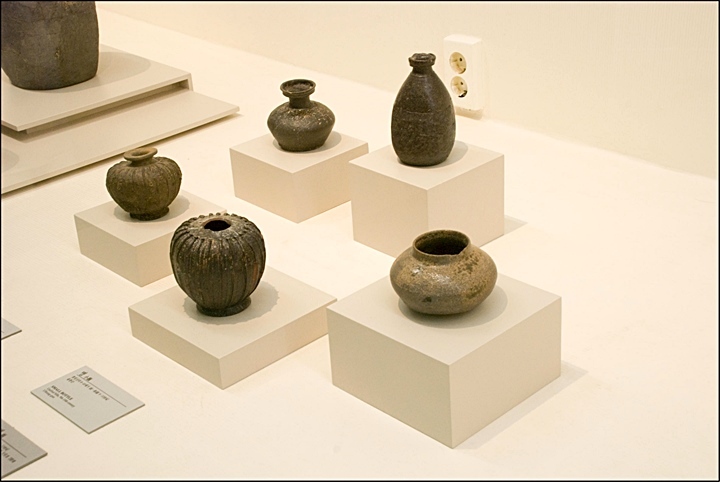 Above right: More earthenware containers and water vessels from Korea’s Unified Shilla Era found in Ulleun Gun. (click images twice. 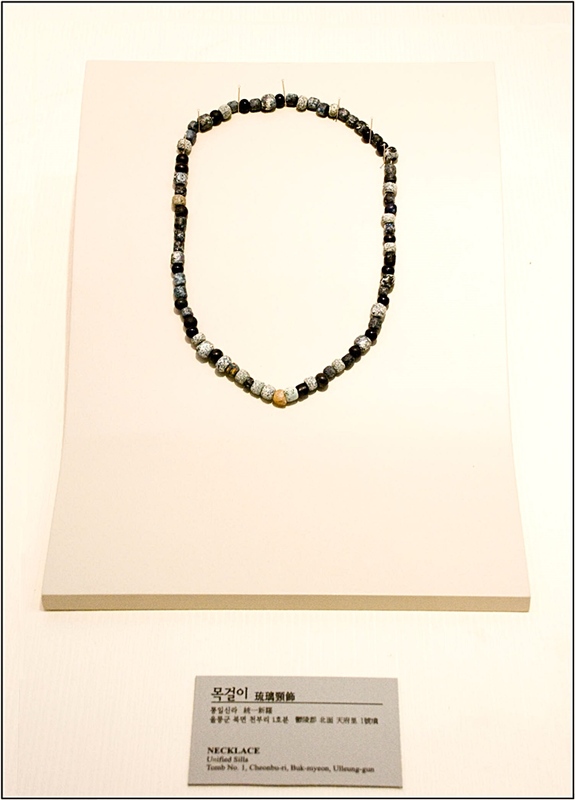 Above left: A simple coloured stone bead necklace from the Unified Shilla Dynasty. This artifact was found at Tomb #1 in Cheon-bu Ri, Buk Myeon. Above right: Assorted gilt bronze artifacts such as bronze bells. 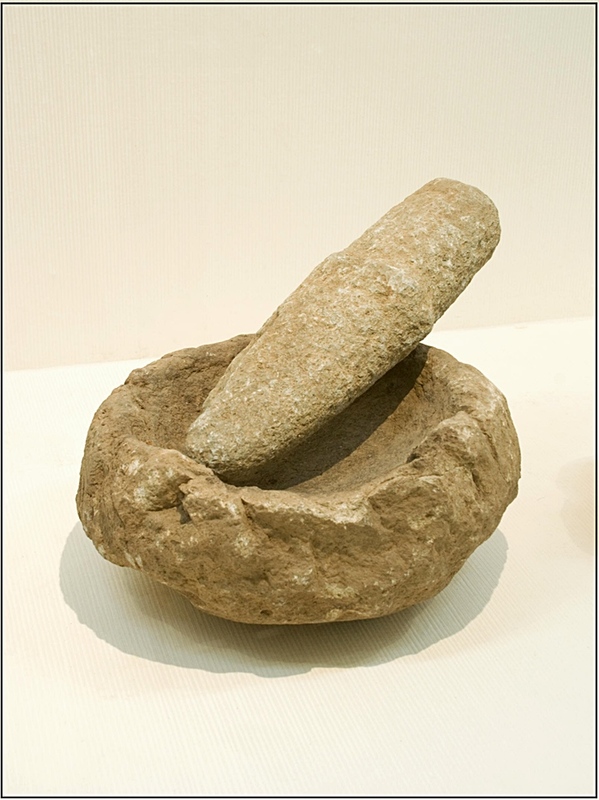 Above are stone two pestles and grinding stones used for making bean paste or perhaps grinding rice. 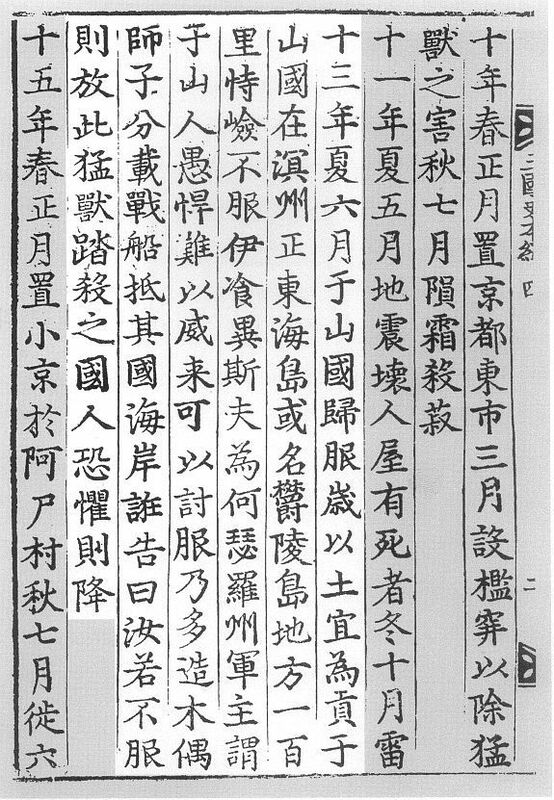 A glimpse of Ulleungdo’s history before Unified Shilla can be demonstrated through Korean records called the “Sam-guk Sa-gi” This document records the circumstances by which Korea forcefully incorporated the Ulleungdo Island region and is dated the year 1145 A.D. This document proves that a political group of Usanguk did in fact exist before at least the 6th Century. In other words Usanguk was a separate self-governed state before Shilla incorporated it. When we look at Shilla’s tactics used in the incorporation process it can be understood how resilient the people of Usanguk must have been. Rather using brute force Shilla had to outwit Ulleungdo’s residents to persuade them into surrendering. 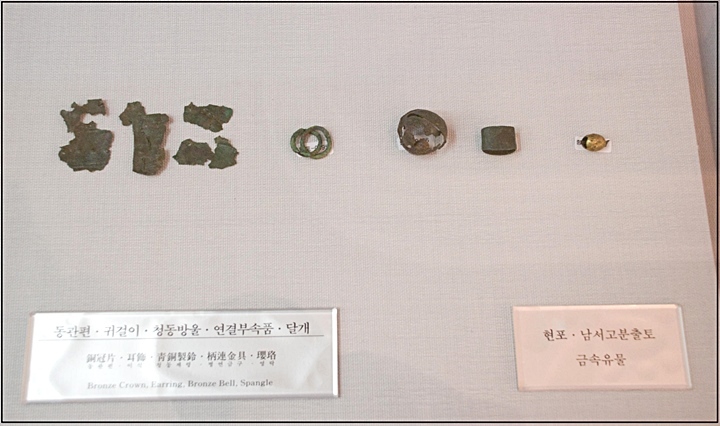 Most of the ancient artifacts found on Ulleungdo are from between the late Three Kingdoms Era and Unified Shilla Era. However, it doesn’t mean Koreans didn’t live there much earlier. Without a doubt ancient Koreans were the first people to arrive upon, settle and govern over the Ulleungdo region. Korean activities there were not brief, by chance landings nor seasonal voyages. Ulleungdo Island was settled on by permanent residents for at thousand years before the arrival of seasonal Japanese fishermen. When Shilla forcibly incorporated Ulleungdo (Usanguk) the inhabitants were obliged to give these tributes to the Korean government. This means the Shilla administration would have dispatched officials to collect these payments. Koreans would have regularly sailed all around the Ulleungdo – Dokdo region during this era. 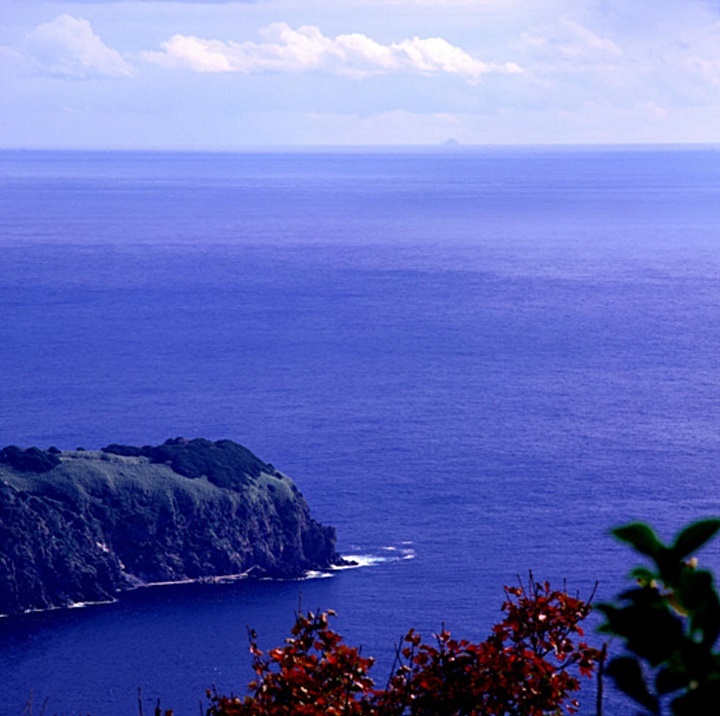 The mere fact Dokdo – Takeshima is visible from Ulleungdo amounts to earliest Korean cognizance of Dokdo Island. 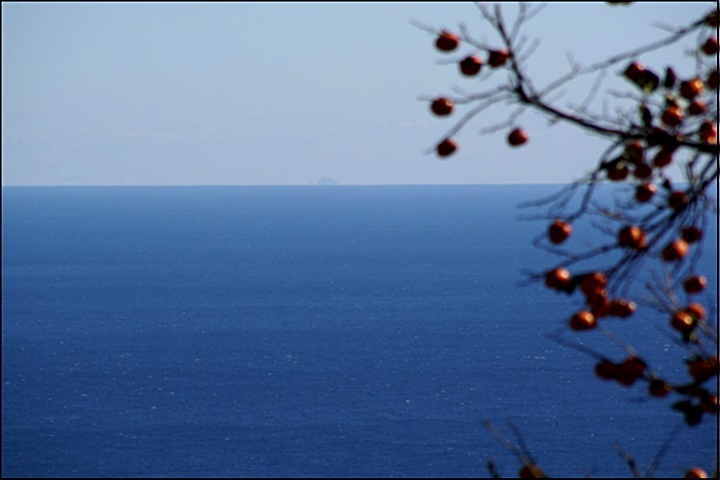 A recent study by the Dokdo Research Institute determined Dokdo Island is visible 3 times a month. This would give Koreans 36,000 opportunities to discover the islets from Ulleungdo before the arrival of the Japanese in 1618. For over thirty generations before Japanese arrived, ancient Koreans on Ulleungdo gazed eastward and saw an island they knew was theirs. We know historically man considered lands visible from his home part of his territory. Thus it’s only logical to think these ancient Koreans believed Dokdo was attached to Ulleungdo or at the very least. Korea’s limit. Korea’s peaceful management over the region would continue until attacks and looting by Japanese pirates at the beginning of the 15th Century. More than five centuries later, Japan’s relentless desire to expand westward continues….